A brief history: I'm originally from Herndon, Va, a suburb of Washington, D.C. I lived in Richmond, Va while attending the University of Virginia before I moved to San Francisco after graduating in 2010. I commuted by bike while I was in school and continued to commute by bike while in San Francisco, where I sold my car after living there for almost a year. The Racer Bite: My first race was the Macaframa Broke Bones alley cat. A couple of my roommates at the time told me about it and went with me. I think I did about half of the check points but I still had a great time. I had just started riding brakeless, I rode with bmx platforms, reload fgfs type straps, and my doc martin boots - haha! My first alley cat also introduced me to a lot of people in the cycling community in San Francisco. From then on I would try to go to as many races as I could, if not to race then at least to support. I am not a cat racer, I finally got a cyclocross bike so I plan on racing that when the season starts again. 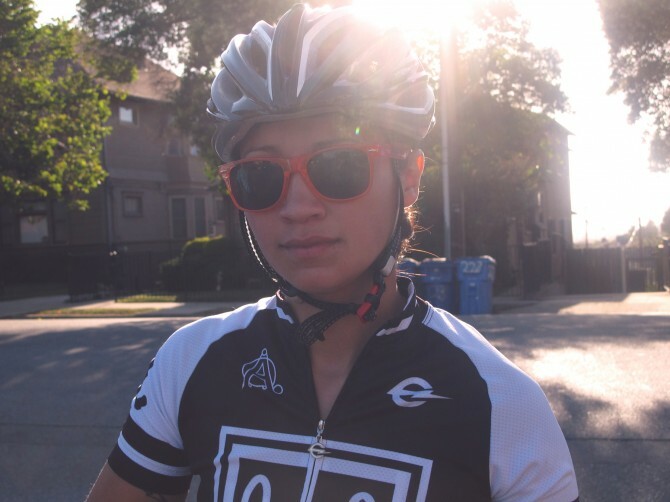 Racing in Cities Across the U.S.: I have raced in SF, Oakland/East Bay, and Richmond, Va. I've ridden in New York, Philadelphia, and Washington, D.C. All those cities are different, but LA is definitely the least cycling friendly. It took me a while to be comfortable riding around. However, I have seen a lot of progress in the short year and a half that I've been here. Off Season: I work full time for a sign company in Atwater Village, I also have my own vinyl decal business, Luv Sik Grafix. Pure Enjoyment: Since I got my cyclocross bike, I try to explore trails as often as possible. It's fun and exciting, I never know what I'm going to find. What's Next for Mel: There is the Where's Waldo alley cat the day before the crit. I'm planning on going to SF for Quake City Rumble. Of course I plan on doing the Wolfpack Drag Race. I want to race the summer series at Encino Velodrome. And as many cyclocross races as I can make it to. on Wolfpack Hustle: I haven't been able to make it to monday night ride yet. I did the crash race for the first time this year. It was like critical mass on steroids, I'm not sure how I did but I'm just glad I didn't crash - haha! I'm nervous and excited because I have never done a crit before. Mel leaves us with, "My advice when it comes to races: Don't forget to have fun! I would also like to thank my sponsors: CBNC, Alabici, Met Helmets, and Unknown Bikes."